This article is going to address the question of how to think about indoor activity and outdoor activity with your dog - once and for all. There have been many questions about this aspect of Natural Dog Training - both here and in the forum - so I thought that it would make sense to talk about how our dogs experience an indoor environment, how they experience an outdoor environment, and WHY you want to basically keep things "chill" inside - and save most of your play and training for outside. 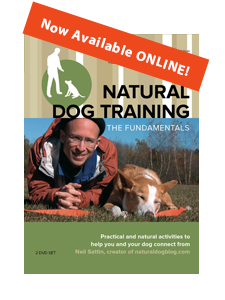 In the process, we're going to cover a few of the most important principles of dog training. I'm always happy to answer your questions about the particulars of dog training. "What do I do in *this* situation? Or *that* situation?" I encourage you, however, to try to remind yourself of the principles on which Natural Dog Training is based. Those principles can guide you through problematic situations, because they allow you to be flexible in how you address whatever's going on with you and your dog. "Rules" - on the other hand - are much less flexible. And techniques, while they can make a difference on their own, are much more dynamic when they're fueled by an understanding of the underlying principles. So there is no rule in the way that I train dogs about "only do such-and-such inside, and only do such-and-such outside". If you ever find yourself thinking that I've suggested a rule to you, then remind yourself that rules are meant to be broken. Frequently. So what are the principles at work here? Maximize your dog's relaxation, and minimize your dog's stress. In general, the indoor environment is more likely to be stressful for your dog. This is because emotional energy, the currency through which your dog is negotiating with the environment, is amplified in an interior space. Things are more intense when you are inside. And less intense when you're outside. Think of emotional energy like sound energy (this will sound familiar to those of you who have my DVD set). If you're inside, you can turn your state-of-the-art sound system up to "5" and be shaking the foundation of your house. Turn it up to "7", and it might be downright uncomfortable for anyone who's listening. Now turn on your outdoor speakers for the dance party you're having this weekend (you know, the ones suspended above your patio). You can probably crank that baby right up to "11" and still focus on getting down without worrying about losing your precious sense of hearing. So just like the indoor environment amplifies sound, with its hard surfaces and enclosed spaces - so does it also amplify emotional energy that your dog is experiencing. Which means that it doesn't take much energy, particularly for a dog that's already a little tense, to really energize your dog. On the other hand, the same kind of emotional stimulation, outside, might barely register on your dog's vibe-o-meter. As your dog experiences the energy of the world, that energy will either flow through them OR get stored as stress. Whether or not it flows through them is determined by two factors. First, how relaxed is your dog? The more physically relaxed your dog is, the more energy your dog will be able to handle without getting into an overload response (barking, aggression, submissive urination, overexuberance). Second, does your dog know what to DO with the energy that they're receiving? Let's say your Aunt Millie comes over to visit, with a basket of chocolate cookies to share. And she's all hyped up from eating cookie dough all afternoon. So she enters your house, throws her arms around you, and practically hollers out "Oh, it's so GREAT to see you!!!! I've missed you so MUCH!!!" Nevermind that she saw you two days ago. That's a whole lotta energy coming into your house, bouncing off the walls and ceilings, and hitting your dog square in the emotional receptors. Your dog has to DO something with that energy to get it out of the system. Otherwise they'll get all charged up without a release, and end up storing that energy as stress. The stress is potential energy that's going to have to come out sometime. And odds are that it will come out in a disproportionate response to some other stimulation. Another dog. The neighbor's child. Your pet rabbit. Etc. You have to give your dog something to do with that energy. The only potential hitch is that when you play with your dog (a la pushing or tug-of-war) you are also creating energy, adding energy to the system. So while they can be a good antidote for the stress-of-the-moment, this "adding energy" aspect is the reason why I generally suggest that you not train or play indoors. In other words, those techniques are good for teaching your dog how to handle the energy created when something happens in an indoor environment - but playing for playing's sake might just be creating more problems down the road by giving your dog more stress to deal with. The alternative to always giving your dog an outlet for their excess energy is to take charge of when they're experiencing it. Let your dog experience energized situations someplace where "11" is manageable - i.e. outdoors. And when you're inside, in an environment that is bound to be stress-inducing for a dog, focus on physical relaxation AND keeping the energy level low. By generally sticking to the "indoors=relaxation, outdoors=action" plan, you will not only be creating a structure for your dog that feels good, but it will also make sense to them on an emotional level. The indoor environment will become more of a relaxing refuge for your dog, which will make your dog much less likely to engage in problem behaviors in your house. And since you're reliably satisfying your dog's need to resolve stress whenever you go outdoors, you will find that your dog is even MORE attracted to you in the outdoor environment. There will be less internal conflict from stress that you've caused your dog by turning up the volume indoors, since you'll be keeping the emotional stereo at a low level. When is it appropriate to train and play indoors? OK, so now you understand more the principles at work in the general rule of how to balance indoor relaxation and outdoor activity. Is it ever acceptable to play with or train your dog indoors? Train indoors when you're trying to address a specific behavior that occurs in the house. For instance, let's say that your dog gets a bit unruly when guests come over. Doesn't it make sense that you would want to teach your dog exactly what TO do in that situation? Take the opportunity to teach your dog, in the moment, what to do with that energy that guests add to the environment (a little pushing, then getting your dog to lie down on their bed and stay for 10 minutes, as an example). Play indoors when it makes sense. Maybe it's been snowing for 3 days in a row. Maybe you've been stuck at home with a head cold. Maybe you have a batch of cookies in the oven. The challenge is - can you find ways to play that will be fun for your dog WITHOUT creating stress? Suggestion: have your dog in a down/stay - then go hide somewhere in your house, and call your dog to come find you, rewarding your dog with a tasty treat and some relaxing massage when you're found. That way you're reinforcing your mooseness, but keeping things relatively low-key. Pay attention and just do what feels right. The key, really, is to take stock of what's going on with your dog, and how what you do influences your dog's emotional state and behavior. Can your dog settle indoors? Good. Is your dog exhibiting problem/overload behaviors? You might want to do your best to minimize WHATEVER is causing your dog stress - since stress and tension is at the root of all problem behavior. Do you just feel like playing inside, just because? Well, go ahead!!!! And just observe what happens. And then adjust if you need to. If you're looking for rules to live by that can never be broken, you've come to the wrong place. My goal is to ensure that you're not acting mechanically with how you approach your relationship with your dog - that you are, instead, developing an awareness of the emotional undercurrents at work as you interact with your dog, and as your dog interacts with the world. As your awareness grows, so will your ability to just do "what's right" - even if it's completely different from what was right yesterday. In the meantime - relax with your dog inside, play and train with your dog outside - and observe how that structure affects your experience. Then, once you think you have a good baseline, change things up - and notice the difference. I think you'll find that there are times when it makes sense to play and work inside - but that otherwise there are HUGE benefits to maintaining the structure. Would you like to discuss this article? 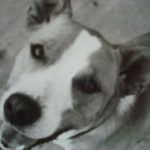 Please join us in the Naturaldogblog Forum. There seems, to me at least, to be a contradiction here. If you push to help your dog release stress on to you, would it not result in a net loss of stressful energy for them? That seems to oppose what you say about playing in doors causing higher energy and stress levels in you dog. Now, of course certain play will amp them up and could cause indoor emotional claustrophobia (to paraphrase your metaphor), but in regards to pushing and possibly tug, this doesn't add up. I might be splitting hairs, because as you said these are guidelines and not rules. Thanks for your comment, and for the opportunity to clarify. I think that outdoor play/pushing allows you to stay one (or more) steps ahead of the curve. i.e. You can resolve the energy of the moment and then some (residual/stored stress). However, in an indoor environment, it can go either way. At best, I think, you'd resolve the energy of the moment (as in the situation where you're working on an 'issue' - like guests coming over). And maybe you'd get deeper than that. The important point, though, is that the act of play/pushing itself creates energy that demands resolution. And because you're indoors, THAT energy is also getting amplified. So it's even more likely that your dog will offload some, not all, of that energy, resulting in a net "gain". If you're pushing/tugging (i.e. choosing activities that allow your dog to resolve stress), then the net gain is not as large as it would have been otherwise (like if, for instance, you were chasing your dog around the house - definitely something you don't want to do, though there are many who do because 'my dog likes to be chased'.) However, it's still a net gain. If someone has a rock solid dog, then it doesn't matter much either way. Probably. However, if you're not interested in the potential for more stress, even in a rock solid dog, then I'd maintain the indoor/outdoor structure that I suggest, at least as a general guideline. If you're dealing with overload behaviors in your dog AT ALL, then you can't really say you've eliminated all sources of stress until you've given the structure a try for an extended period of time (say, 90 days at least). At that point you can at least discern the difference it makes for your dog over time.